Meeting of kingmaker party, the Bridge of Independent Lists, MOST, centre-right and centre-left coalitions just started in Zagreb. MOST stated that either they will come up with a name who will form the government or there will be new elections. Bozo Petrov, president of kingmaker party the Bridge of the Independent Lists, MOST said that negotations on prime minister designate will continue with centre-left coalition until Tuesday and the last round of presidential consultations on forming the government. Montenegro's opposition will take to the streets of Podgrica again on Sunday, repeating their call for a transition government to replace Prime Minister Milo Djukanovic. MOST, the kingmaker party in the Croatia elections have set a new deadline for centre-right coalition, led by Croatian Democratic Union, HDZ. 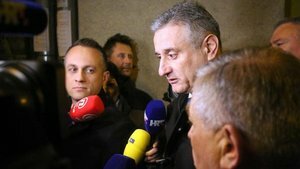 They say HDZ has until Monday 4 PM to join the negotiations for forming a government, after Tomislav Karamarko, leader of HDZ coalition, left the talks on Saturday evening. Montenegro’s police has stepped up security in Podgorica, on Sunday ahead of the opposition's anti-goverment protest demanding free and fair election. 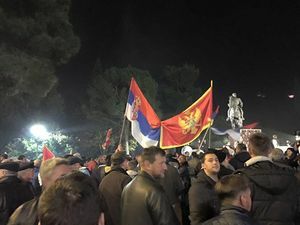 Several hundreds anti-government protestors gathered in front of the Montenegrin parliament carrying Montenegrin and Serbian flags. Protesters were shouting "Milo thief" while Janko Vucinic, leader of the Workers Party, called for the arrest of veteran Montenegro's Prime Minister Milo Djukanovic, who has been in power since 1991. Anti-government protestors set up dozens of tents in a park opposite the parliament building in capital Podgorica. One of the opposition leaders, Nabojsa Medojevic, said the protesters would set the tents again and fight for freedom as "the power of the dictator in not in his body armour." 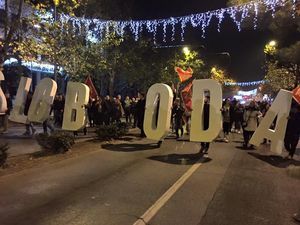 The anti-government protest in the capital Podgorica ended peacefully. 23, against "the deception of the public broadcaster RTCG." The rally on Wednesday will be 10 in a row of anti-government protests. 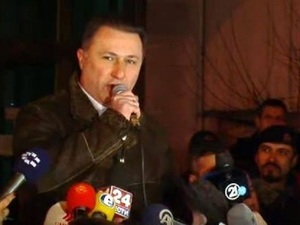 Macedonia's ruling VMRO DPMNE party leader and former Prime Minister, Nikola Gruevski, delivered a defiant speech filled with threats in Skopje on Saturday evening in which he announced that his party will not participate in possible electoral reruns, pledged to stop foreign ambassadors from allegedly interfering in domestic affairs, and announced purges in foreign-funded NGOs and institutions. 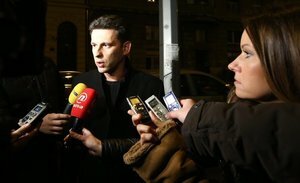 Gruevski’s heated speech was delivered to his party’s supporters, who are gathered for the third day in a row in front of the State Electoral Commission, DIK, which has been deliberating on complaints from the opposition regarding the high-stakes general election held on November 11, which ended in a near tie. The DIK has so far accepted one of eight electoral complaints filed by the Albanian opposition BESA party and rejected seven that were filed by the main opposition Social Democrats, SDSM. It is currently mulling the file complaint from the SDSM, which if accepted may have an impact on the election outcome and could potentially even out the number of MPs that the ruling party and the opposition won in last Sunday's vote. The results so far awarded 49 seats to the SDSM and 51 to the VMRO DPMNE party. Nikola Gruevski, Macedonia's former Prime Minister and the leader of the ruling VMRO DPMNE party, delivered a headstrong address to his supporters in Skopje on Saturday evening, stating that his party would not participate in possible electoral reruns, threatening purges within foreign-funded NGOs and institutions from the civil society and pledging to stop foreign ambassadors from meddling in internal affairs. Outing Prime Minister Boyko Borissov wants a fast-track parliamentary vote for a majoritarian electoral system in return for forming a government with the right-wing Reformist Bloc party and the nationalist Patriotic Front. Read more. The Albanian Catholic Church has been praised for deciding to organise a charity Christmas lunch instead of holding its annual reception for politicians, ambassadors and other public figures. Read more. Despite the party’s relative success in the October local elections, the leadership of the Party of Democratic Action, SDA, looks increasingly under siege from enemies inside the party and out. Read more. 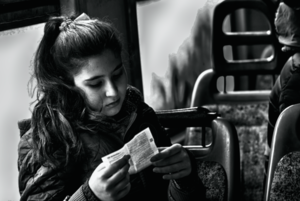 The latest flu epidemic in Kosovo exposed all the well-known problems in the country’s healthcare, from drug shortages to delays and corruption. Read more. 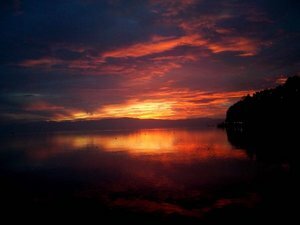 A pyrotechnist was killed by a landmine on Monday in Zemunik, near the Croatian coastal town of Zadar, local police reported. The man was attempting to demine a minefield leftover from the 1990s war when the incident happened. Ramiz Lladrovci from the Kosovo Democratic Party, PDK, won the snap municipal election in the town of Gllogovc/Glogovac near Kosovo’s capital, Pristina, in a runoff with opposition candidate Isa Xhemajlaj from the Initiative for Kosovo, NISMA. 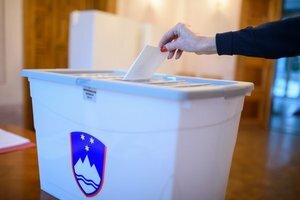 Gllogovc/Glogovac has been a stronghold of the ruling PDK since 1999, but for the first time in the history of multi-party elections in Kosovo, it failed to win the mayoral elections in the town in the first round of voting on December 4. Lladrovci is a former Kosovo Liberation Army fighter and for the last year he was Kosovo’s ambassador to Albania, a position he resigned from in order to compete for the role of mayor of the municipality. This snap election was the first test for PDK after the chair of the Kosovo assembly, Kadri Veseli, took over as leader of the party from Hashim Thaci, Kosovo’s current president. A series of images edited to falsely convey the funerals of a number of living Western ambassadors and foreign representatives to Macedonia appeared on image sharing website Imgur following the inflammatory speech made by Macedonia’s ruling VMRO DPMNE party leader, Nikola Gruevski, on Saturday. In his public address, Gruevski accused foreign diplomats of interfering with the work of the State Electoral Commission, suggesting they were trying to rob him of his victory in the November 11 elections. 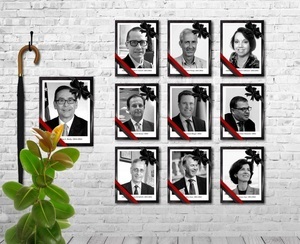 Ten of the most prominent Western diplomats, including US Ambassador Jess Baily and EU ambassador Samuel Zbogar, are featured in the edited images, as well as former EU mediator in Macedonia Peter Vanhouotte and former European Parliament rapporteur on Macedonia Richard Howitt. The creator of the images has not been named. This Imgur image falsely conveys the funerals of a number of living Western ambassadors and foreign representatives to Macedonia. Bulgarian political parties have moved closer to forming a new government within the current parliament under the mandate handed by President Rosen Plevneliev to the right-wing Reformist Bloc coalition on December 13. Following a meeting on Monday between the Reformist Bloc, Bulgaria’s leading party, GERB, and the nationalistic Patriotic Front coalition, GERB’s vice-president Tsvetan Tsvetanov said that a “clearly defined parliamentary majority” exists for forming a new cabinet. 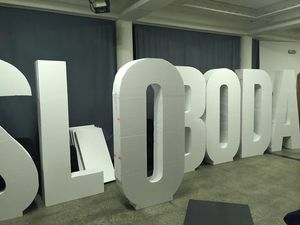 However, Tsvetanov, made it clear that the Reformist Bloc will have to nominate a Prime Minister, despite its leadership earlier insisting that current Prime Minister Boyko Borissov, also the leader of GERB, keeps his post. Nayden Zelenogorski, co-chair of the “reformists”, explained that currently the parties are discussing policies and members of a potential cabinet that could be named on Tuesday, which is the deadline they have to set up a new cabinet with the current parliament. If no consensus is reached during the ongoing negotiations, the President will have to form a caretaker cabinet. Nearly half of Bulgarian companies operating in the country believe the business climate in Bulgaria has worsened in 2016 compared to last year, the annual business survey of the Bulgarian Industrial Association, published on Monday, shows. While 48 per cent of the companies surveyed gave a negative assessment of the business environment in Bulgaria, 31 per cent said that their company’s results improved throughout the year, a jump of 19 per cent compared to 2015. Still, over one third (35 per cent), of Bulgarian firms complained their results worsened this year. The president of Bosnia's Serb-led entity Republika Srpska, Milorad Dodik, has sent a telegram of condolences tonight to Russian Foreign Minister Sergei Lavrov over the murder of the Russian ambassador to Turkey, Andrei Karlov. Local media report that Dodik said: "Your principled policy has contributed to the establishment of peace and stability in many places in the world, always in accordance with international legal norms, which makes the tragic death of Ambassador Karlov even more difficult." 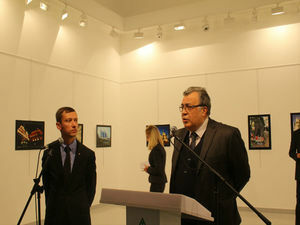 Karlov was shot dead tonight as he gave a speech to open an exhibition in Ankara. Macedonia's main ruling VMRO DPMNE party condemned the online appearance of falsified images that were edited to picture the death notices of a number of Western ambassadors and foreign representatives. "This act is completely unacceptable and prohibited and has to stop in the future," the party said in a press release. 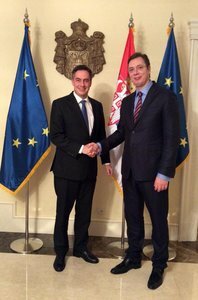 The false death notices appeared on the image-sharing website Imgur soon after VMRO DPMNE leader Nikola Gruevski, in speech on Saturday, accused foreign diplomats of interfering with the work of the State Electoral Commission, suggesting they were trying to rob him of his victory in the November 11 elections. Moscow and Ankara have made it clear that they will not allow Monday’s assassination of Ambassador Andrey Karlov to disrupt Russo-Turkish rapprochement. Read more. After being forced to flee from wars twice in her life, Donika Castriot, the wife of Albanian national hero Skanderbeg, lived the last years of her life in Valencia, where she is still buried today. Read more. 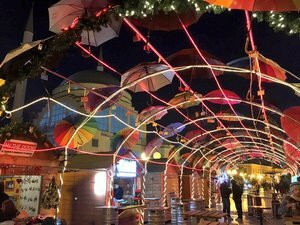 At the time when the squares of the Kosovo capital are lit up for end-of-year celebrations, one devout 40-year-old told BIRN that he and his family will - as usual - be taking no notice. Read more. The Slovenian foreign ministry returned boxes of chocolates given to it as Christmas presents by the Croatian embassy in the country, Slovenian Denvnik.si news portal reported on Tuesday. 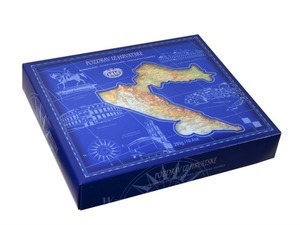 The ministry said that is considered the chocolate presents, manufactured by a Croatian company Kras, as a provocation because they featured a 3D map of Croatia with the maritime border going through the middle of the Piran gulf between the two countries. 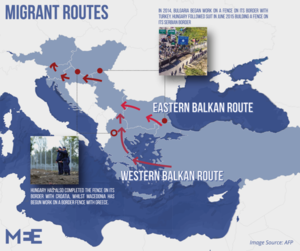 Croatia and Slovenia are currently in a dispute over their maritime borderd, with Croatia claiming the line should go through the middle of the gulf. The ministry returned the chocolates in bags with the country’s tourism slogan, 'I Feel Slovenia', written on them. Turkey’s state-run Anadolu press agency announced that one of the people wounded in Monday evening’s assassination of the Russian ambassador to Turkey was born in Albania. Leyla Gundogan an Albania-born Turkish citizen, was attending the exhibition titled “Russia as seen by Turks” at a photo gallery in the Turkish capital, Ankara, when police officer Mevlut Mert Altintas shot Russian diplomat Andrey Karlov. Gundogan was taken to hospital along with other wounded and her injuries have not been fatal. 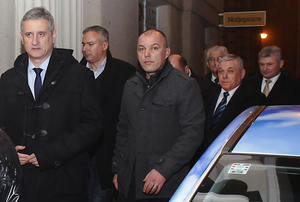 Following Monday evening’s terrorist attack in Berlin, Croatian Prime Minister Andrej Plenkovic said that terrorism is happening in all EU states and Croatia is paying close attention to the issue. He added that the security situation in his country is good and police are monitoring the borders. The Albanian General Prosecution announced on Tuesday that two Albanian MPs and one major must step down because they had hidden information about their criminal pasts. The three officials had been convicted under different names in other European countries for charges including solicitation of prostitutes. The three men - Shkelqim Selami, an MP from the junior government party the Socialist Movement for Integration, LSI, Dashamir Tahiri, an MP from the opposition, and Elvis Roshi, the mayor of Kavaja and member of the Socialist ruling party - are going to be removed from their positions under Albania’s law banning people with criminal records from public office. An app has been launched in Bosnia and Herzegovina by environmental NGO Eko Akcija to tell users about air quality in different cities around Bosnia, including Sarajevo, Zenica, Prijedor and Jajce. Several cities in Bosnia have a serious air quality problem, with regular smogs in the winter. Today's reading for PM10 (particulate matter under 10 micrometres in size) at 4pm in Sarajevo was 336 µg/m3, indicating very unhealthy air quality. EU air quality regulations, for example, mandate a maximum 24-hour average value of 50 µg/m3. Montenegro reported its first case of bird flu on Tuesday after a dead duck was found infected with the H5N8 strain of the illness on Lake Skadar in the east of the country, state television reported, Reuters reported. Montenegro's food safety agency said there was no risk for humans but recommended that farmers keep their chickens indoors and take all preventive measures, the television reported. Let down by the public health system, some Greeks are sharing pills, skipping medicine or putting their faith in a growing industry of nutritional supplements. Read more. Serbian Prime Minister Aleksandar Vucic will meet Russian Defence Minister Sergey Shoygu in Moscow about an agreement to acquire fighter planes and other military equipment, although details of the deal are unclear. Read more. Kosovo MPs spent more than five hours debating the mysterious death in prison of the opposition activist Astrit Dehari while demonstrators rallied outside the parliament. Read more. 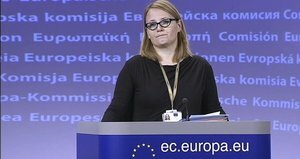 The United States are "concerned about heightened political tensions in Macedonia following the December 11th parliamentary elections" and "condemn the inflammatory rhetoric from some political leaders which gives license to attacks on democratic institutions and ambassadors accredited to Macedonia" US State Department spokesperson John Kirby said at the beginning of the December 20 daily press briefing in Washington. The reaction comes after Saturday's inflammatory speech by Macedonia's ruling VMRO DPMNE party leader Nikola Gruevski who accused the State Electoral Commission and western ambassadors of plotting to steal his election victory and threatened local civil society groups financed from abroad.
" We call on political leaders to stop unwarranted attacks, respect the democratic process, and allow the formation of a credible, stable government committed to the rule of law, accountability, and fundamental freedoms" Kirby said adding that Washington would assist such government to achieve Macedonia's goals of Euro-Atlantic integration. 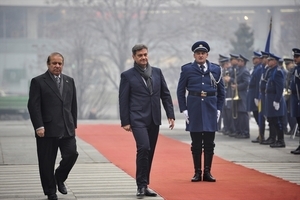 The Prime Minister of Pakistan, Nawaz Sharif, has been welcomed in Sarajevo by chair of Bosnia and Herzegovina's Council of Ministers, Denis Zvizdic. Sharif is visiting parliament today and speaking at a business forum later this afternoon, and tomorrow he will visit the grave of wartime president Alija Izetbegovic, whom he met when he visited Bosnia in 1993. Sharif happened to arrive in time of one of the winter's first bad smogs in Sarajevo. Experts are issuing warnings after measuring stations in the city registered air quality worse than Beijing this morning. 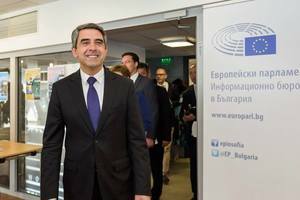 Bulgarian President Rosen Plevneliev will not form a caretaker government under his mandate, which ends on January 22, and will leave the President-elect Rumen Radev to nominate a team, Plevneliev announced on Wednesday. Plevneliev is obliged under the constitution to set up an interim cabinet, after Prime Minister Boyko Borissov’s coalition government resigned on November 14 and no party succeeded in forming a new government within the current parliament. He earlier proposed to Radev, who is entering office on January 22, to appoint a caretaker government team, but the Socialist-backed President-elect refused, meaning that Bulgaria will likely have two temporary governments until preliminary elections are held next spring. Plevneliv noted the unusual situation the country will be in for changing two governments in less than a month, claiming “we will enter the fun section of the world news”. He also added that two Presidents with two interim governments would be a sign of division in Bulgaria. Serbian Prime Minister Aleksandar Vucic’s talks with Russian Defence Minister Sergey Shoygu on an agreement to acquire fighter planes and other military equipment are currently ongoing in Moscow. 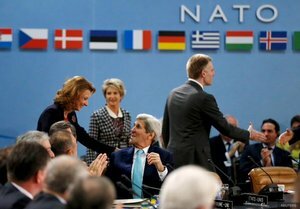 During the discussions so far, the Russian minister has thanked Serbia for its help in providing aid for the civilians in the Syrian city of Aleppo and asked Vucic that joint Serbian-Russian tactical army exercises continue to be held each year.